You have to be logged in to your account for it to work. I know. I did that. it doesnt work on everyones account. Hmmm... odd... still works for me, and I don't think the address is user-specific. That came form a chat session with MJ. Yeah it just forwards me to my account page. the links works for some, and not others, and no one has figured out just why Still works for my 2 MJs with 3 and 4 years left. Recently there has beeen a dispute between MJ (actually, its affiliated company YMAX Communications) and Verizon over the amount of call termination charges etc., resulting in some calls between the two companies not being connected unless long distance fees were to be charged or prepaid minutes were to be used. 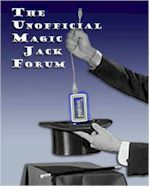 But today MagicJack and YMAX announced that the dispute has been settled, so I would think that calls between the two companies should go through OK now. Also, MJ announced that it has developed a new device that can more easily work with Wi-Fi and 4G connections. More specifically, it has modified the MagicJack Plus device to include two USB slots, one USB plug, and a micro SD slot. Apparently the company made these modifications to improve functionality with Wi-Fi and 4G/LTE services, and to hopefully "offer discounted Internet access to new and existing customers using this device" (along with other, unspecified new functions and features). They expect the new product to be available in early Q2 2013. It will be slightly larger than the magicJack PLUS and will also offer "high definition (HD) voice." MJ also claims that there will be one or more additional new products to follow in 2013 that will utilize a new 55nm chip designed for portable use and which will include a super scalar one Ghz CPU and much larger GB DDR2 or DDR3 memory "as well as over 25 other functions" (- maybe functions similar to PCSoft's MagicFeatures Plug-IN???). The company also states that they will continue to sell the magicJack PLUS "as its price-leading model" - so expect the new device(s) to cost more at the retail level.